Episode 002 DRIVE - Usama Siddiquee: "Every joke has to have a corpse." – Let's Talk About Sets! Episode 002 DRIVE - Usama Siddiquee: "Every joke has to have a corpse." The undeniable Usama Siddiquee talks all about the “drive” to do stand-up. His work ethic shines off him in his presentation, his material, and his omnipresence in the New York comedy scene. He shares his philosophy about the internal work it takes to get better as an artist along with the incredible story of how his friends helped him make it to New York to pursue his dream. Mostly frenetic and hilarious, you’ll get the frothing fervor all three comics share for stand-up, peppered with philosophies of success and creative drive. You’ll laugh while they tear each other to stereotype shreds; and you’ll come away wondering, “Just how skinny IS Usama? How bald is Jeff? What is the point of Harrison?” This episode is an absolute dynamite listen for anyone looking to be inspired to get out there and do it! EDITORS NOTE: This was before I learned how to edit well, so it’s one long cut instead of a carefully constructed narrative–but it’s still one of the most popular of our episodes. He’s just that great of a guest. Usama Siddiquee is a standup comic and light-speed comedy host. His high-energy comedy style and turbo-riffing can be seen all over the U.S., and he’s a “made man” at New York Comedy Club in Manhattan. 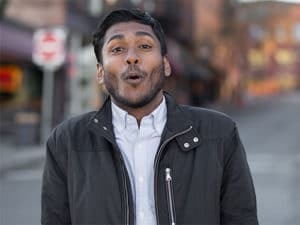 He wrote about himself, “Usama Siddiquee is a Bengali-American stand-up comedian and actor based in New York. He’s the kind of comic you want to follow right now, so you can totally gloat to your friends about how you were totally into him before he got huge. And then they’ll get really jealous of your impeccable foresight and superior taste.” This would be so, so irritating if it weren’t dead-on accurate and abundantly apparent to everyone who sees him perform. He was most recently the 1st place winner of the 2016 Laughing Devil Cup Comedy Festival in New York; the 1st place winner of the 2015 Yonkers Comedy Festival as well as the 1st place winner of the 2015 Make Me Laugh Albany Comedy Festival. He was also featured this year on both FusionTV and Huffington Post. Special thanks to Louis CK, John Mulaney, Arj Barker, and (as always) Salt ‘N Peppa for all of our definitely fair use.